ArtsLIVE! 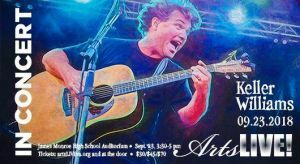 will hold its 2018 Fall Fundraiser featuring Keller Williams in concert Sunday, September 23, 3:30 – 5:00 pm at James Monroe High School Auditorium. Nonconformist and unconventional, Keller Williams seamlessly crosses genre boundaries. The end-product is astounding and the novel music encompasses rock, jazz, funk, and bluegrass, and always keeps the audience on its feet. Tickets are $30 for general admission, $45 for reserved seating, and $70 for VIP. VIP ticket holders are entitled to front row(s) seating, access to the hospitality room prior to the concert and entry to a meet-and-greet reception with Keller Williams. For more information please visit http://artsliveva.org/event/sept-23-keller-williams, email thearts@artsliveva.org, or call (540) 374-5040. All proceeds benefit ArtsLIVE! education and outreach programs.